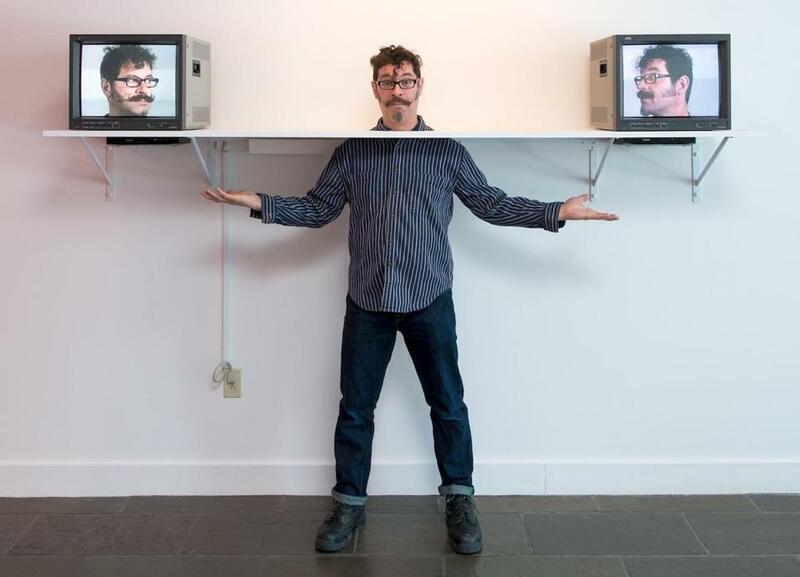 FITCHBURG — Humor, wordplay, food, and the artist’s handlebar mustache dress up much of “Jeffu Warmouth: NO MORE FUNNY STUFF,” now at the Fitchburg Art Museum. It’s a crowd pleaser with a lot of noise (a little too much) and frivolity, but at its heart lie compelling existential quandaries. For an institution trying to remake itself, under new director Nick Capasso, as the premier venue to see New England art, this is a significant show. The first contemporary show under Capasso’s watch last fall, “Still Life Lives,” coaxed visitors used to a conservative exhibition agenda to view flashy new approaches to a fusty old format. Even so, the art pretty much remained motionless and on the wall. Warmouth brings a new world of mediums to this museum: performance, video, and installation art. He teaches at Fitchburg State University, so he’s a local, and he has a wildly active career in the Boston area. The entry point to his art is humor, which makes it easily accessible. But it’s also a risk; the work can read as gags, gimmicks, and razzmatazz. Some of it falls flat. The video at the show’s entrance, “No More Funny Stuff (4-Way Cymbal Monkey)” merely shows four Warmouths, two upside-down, wildly playing cymbals. I had the urge to yank it offstage with a giant hook, vaudeville-style. This midcareer retrospective reaches back to Warmouth’s undergraduate efforts. The early works, such as a photographic collage of two sad, masked clowns in bowler hats in “He Dreams About Samuel Beckett,” chart out his interests. Warmouth’s art still rings with tragicomedy and angst that echo Beckett’s. But the first act of “NO MORE FUNNY STUFF” is more Claes Oldenburg and Andy Warhol than it is Samuel Beckett. In grad school at the School of the Museum of Fine Arts in the mid-1990s, Warmouth started photographing comic scenarios in which food stood in for people, or just served as the basis for visual puns. “Extraction” depicts dental tools coming at a seedy hole on the face of a green pepper. For “Cross-Checker Pepper Hybrid,” the artist cheekily traded sections of green and red peppers to make checkerboard patterns on each. Several videos employ food as characters. Even the more rudimentary of these, such as “Il Spaghetti Occidentali,” shot largely on a kitchen floor with elbow macaroni standing in for guns, make such skillful use of B-movie tropes and winkingly broad humor that they’re rife with chuckles. Over time, Warmouth deepened his passion for food into an investigation of branding and consumer culture, presenting canned and boxed goods with his likeness on the label in his installation “SuperJEFFUMarket.” He slyly introduces his existential angst in products such as “Crushed Resolve,” startlingly subverting packaging’s usual upbeat sales patter with something messier and more like life. The food phase hits a shrill crescendo with the carnival-like interactive video installation of “JeffuBurger” and “JFC,” competing fast-food vendors. Push a button at either stand, and the guys behind the counters go into action, hurling insults at each other as they tempt you with their wares. “Burger Muffs,” for instance, can be worn like earmuffs. Much of the humor here stretches thinner than a quarter-pounder. The most affecting work, unreservedly, is the most recent. Warmouth leaves food behind and makes himself an everyman. Associate curator Mary Tinti has erected a small version of the 80-foot-tall Boston Convention & Exhibition Center video marquee, where Warmouth has regularly contributed to a slate of video art. In “Fall,” several versions of him plummet through a cloud-filled sky, like Yves Klein’s photomontage “Leap Into the Void,” and Don Draper’s silhouette in the opening credits of “Mad Men,” landing in a pool of limpid blue water, where they swim. “I UP” riffs on old arcade video games, with little Jeffus scrambling up ladders and jumping over precipices. Pac-Man’s plight — and by implication, Warmouth’s and our own — is life as an endless round of pursuit, consumption, peril, and destruction. He sets up an equally vexing dynamic in the three-channel video projection “Merge.” Again, several Jeffus appear. When two in the same costume show up, they jump at each other and become one. It might be a metaphor for any relationship, most poignantly an internal one. The resulting figure struggles, stretching and morphing like a reflection in a funhouse mirror, but never looks quite right. There were many laughing visitors of all ages at Warmouth’s exhibition the day I visited. A performance piece runs intermittently through the exhibit, “Three Heads Are Better Than One.” (The next performance is March 23.) The setup is ready to go: Two of his heads on video monitors on a shoulder-level shelf. They look friendly and alert, as if they’ve come off the Brady Bunch grid. In performance, the artist pokes his head through a hole between the two monitors. A little girl stepped in while I was there. Her family took her picture. It was comical, because she was stuck there momentarily, just her head on a shelf between two smiling Jeffu heads. It didn’t seem like a bad fate. But then again, it did: trapped on a shelf with two of the same joker with the handlebar mustache. Forever. Like Vladimir and Estragon, waiting for Godot, and never getting anywhere. Very funny, and very sad.